It is Wednesday morning, September 5th. Awake at 7, I read about Corsican menhirs for an hour, then threw open the curtains and welcomed the day, a bright sunlit day on the French Riviera! Sounds good enough to be a novel and, to be sure, I am a bit in that mode. I am in Nice. I arrived yesterday at about noon local time. I am so happy to see the sun! After what felt like weeks of rain and near daily thunderstorms in Wisconsin, a blue sky is a blessing for the psyche. That nasty Wisconsin weather played a dramatic leading role in the story of this trip’s beginning. Back to September 3rd, Monday; Packed and ready to leave, bus tickets in hand, we had to Uber to the bus station. A walk would have taken us 15 minutes but it was pouring rain. The bus was late; the cause – traffic problems and construction exacerbated by the rain – the two-hour ride to the airport took 4 hours. Did I say our flight was at 5:05 pm? We got on the bus 20 minutes late, at 1:00 – four hours on the bus … You got it! We arrived at Terminal 5 at O’Hare airport at 5:00 pm. Miraculously, we did not miss our flight! At 4:59 pm we received word that the flight was delayed until 5:45. Yes! There is a travel god! And she is sympathetic to lowly humans trying to go on vacation! Fortunately, the international terminal at O’Hare is compact, and we did not have to race down long corridors nor dash around people whose flights don’t leave for another 2 hours and who are just dilly-dallying around using up all that extra time the new travel conventions demand. 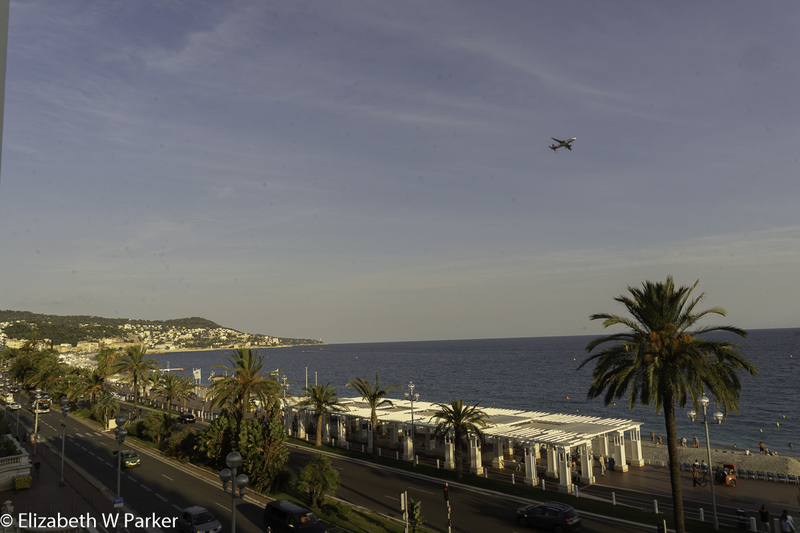 So, yes, we made our flight, and we made our connection from London Heathrow to Nice thanks to a 4-hour layover, shortened to 1 ½ by the lateness of the Chicago flight. It was really a marvel of design and engineering. The seats were very comfortable, the pillows excellent, a choice of blankets, and best of all: a drawer for putting all your stuff (phone, glasses, etc.) I am still waxing rhapsodic about that drawer! Arrival in London was otherwise uneventful, just as every flight should be. We had a bit of a time finding our gate for our connecting flight. It was going out of the same terminal where we arrived, so it should have been easy but, because of a gate change, we had to take the train twice, backtracking, to find the proper gate. Even so we arrived in Nice, with all our stuff, relatively rested, and ready for adventure. 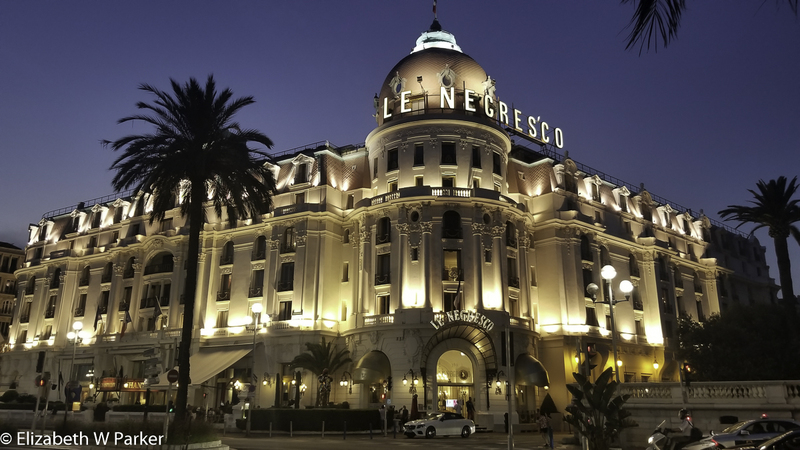 Our hotel in Nice is the Negresco. Yes, yes, it is an indulgence, but one we are gladly making. I first laid eyes on the Negresco when we were here in 2001, on our Euro-year trip with our kids. On that trip, we were in Nice for a frolic on the beach. (It was March and the water was way too cold for me even at that “young” age). The Negresco particularly caught my eye. I think I vowed right then to someday walk through its doors as a guest. Today, we plan to explore the hotel, but what little we have seen so far is beyond my imaginings. The service is every bit what a 5-star hotel should be! While waiting for our room to be readied, we went out for lunch. I had a Salade Niçoise (I am in Nice!) and Gerry opted for the plat du jour, fish and chips. (Apparently you say “fish ‘n chips” as “Fish ‘n Chips” in French, too!) 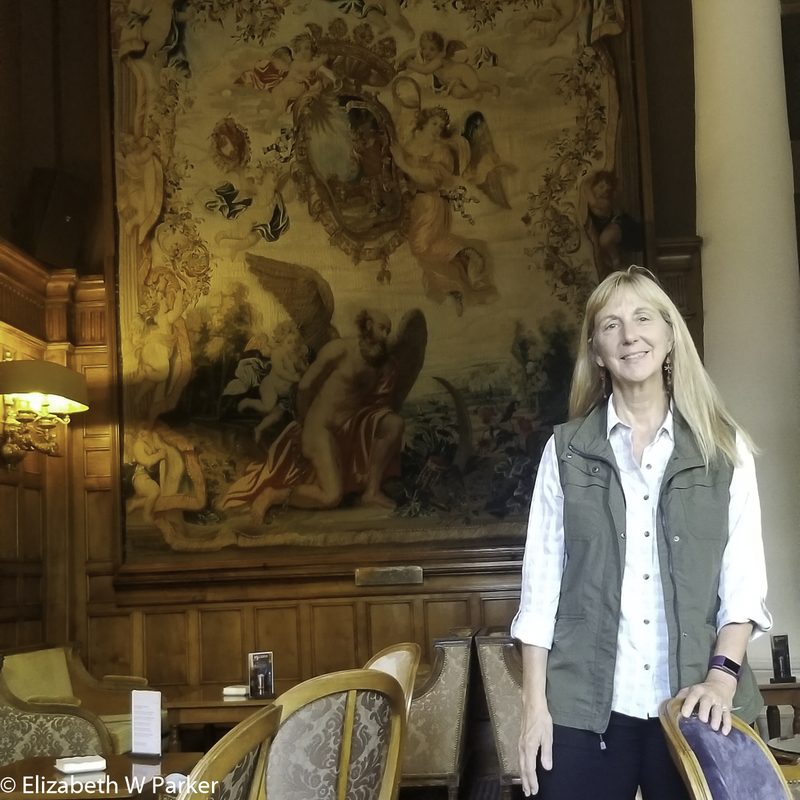 After lunch, our room still wasn’t quite ready, but we were ready to relax, so a free drink as consolation for the wait in the beautiful bar at the Negresco was just what we needed and what we were offered. Our room is fantastic – we were upgraded to a sea-view and a junior suite. We couldn’t more than ooh and aah for a few minutes before sleep overtook us. at the next table, but once resolved, our dinner was relaxing and delicious. We enjoyed walking to the Old City back and forth on the Promenade des Anglais. Here’s a slideshow of some of the sites along the way. We did detour through the Jardin Albert 1 to the Place Masséna. There were these odd figures perched on top of tall columns. The explanation I found says that this work of monumental art, by the Spanish artist, Jaume Plensa [Crown Fountain, MIllenium Park, Chicago], is called “Conversation a Nice.” The figures represent the seven continents. At night the figures cycle through different colors to represent the dialogue between the peoples of our world. Go figure! We got a slow start to the day, perhaps because we were mesmerized by the unfolding morning over the Mediterranean just out our window. The promenade is full of runners and an occasional walker, but elderly people out for people-watching, young families on the beach, and teenagers hanging – that will all wait for a later hour. We took an Uber to the Matisse Museum. 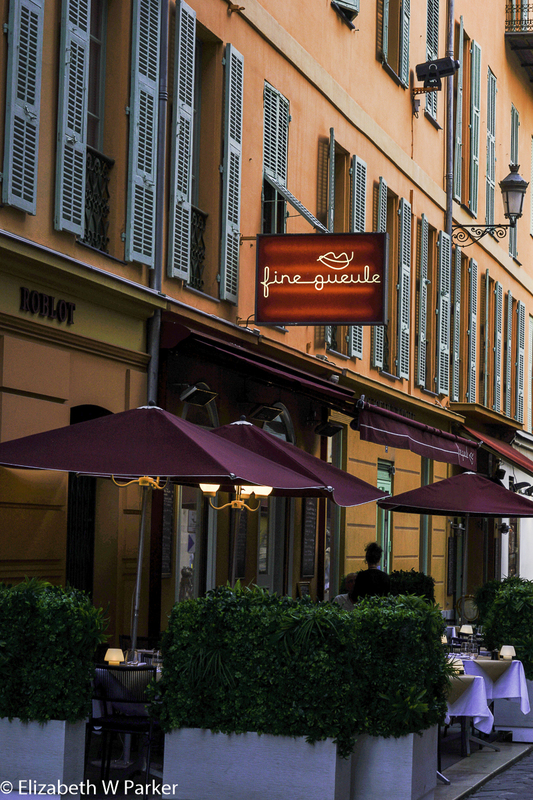 It is fortunate that walking would not have forced us on such a circuitous route, but we did get to see some of the residential neighborhoods of Nice. 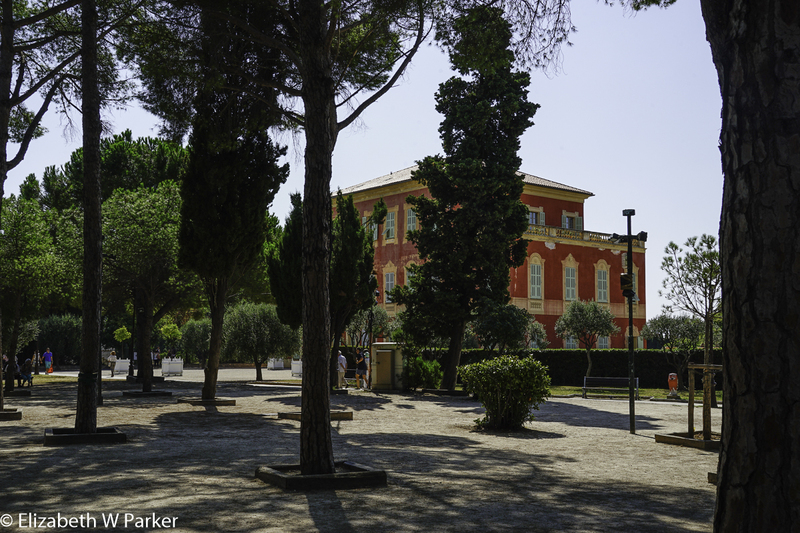 The Matisse Museum is set in a little park complex which includes the Roman ruin of a small amphitheater, and the Museum of Archeology (very aptly located). [The site is called Cimiez Arena and includes much more than what we saw.] The Museum has a modern underground approach to a Neo-Classical villa. I did not see an accessible way to get in; we went down the equivalent of two flights of stairs to the courtyard at the entrance (and exit). The main exhibit today was about Matisse and Picasso – as rivals and friends – the “Comedy of the Model.” The explanation of the exhibit was a masterpiece of “art historian speak” – and took several readings just to understand which words went with which others, still without an inkling of what it meant. We looked at the pictures and read the captions. 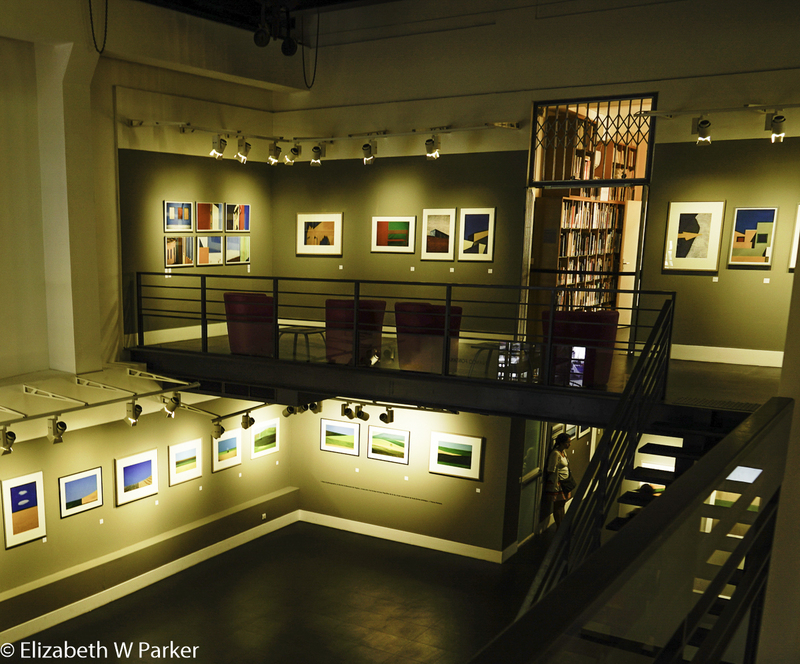 I good portion of the exhibit was photographs of the artists at work and with their models…and paintings created during those photos. It was very interesting – and exciting to see the work of two such major artists side by side. From the Matisse Museum, we began to walk downhill to the Chagall Museum. The Chagall Museum is in a small park, too. Here you purchase a ticket at what looks like the entrance, then go out of that building to another entrance into the display spaces. 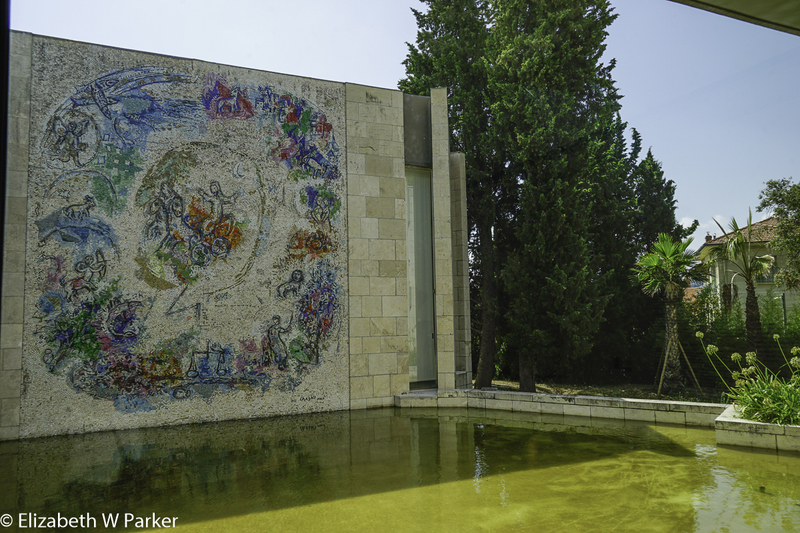 The main theme of this museum, or at least the exhibition when we visited, was the work Chagall did for the Rosary Chapel in Vence (where the windows are by Matisse). 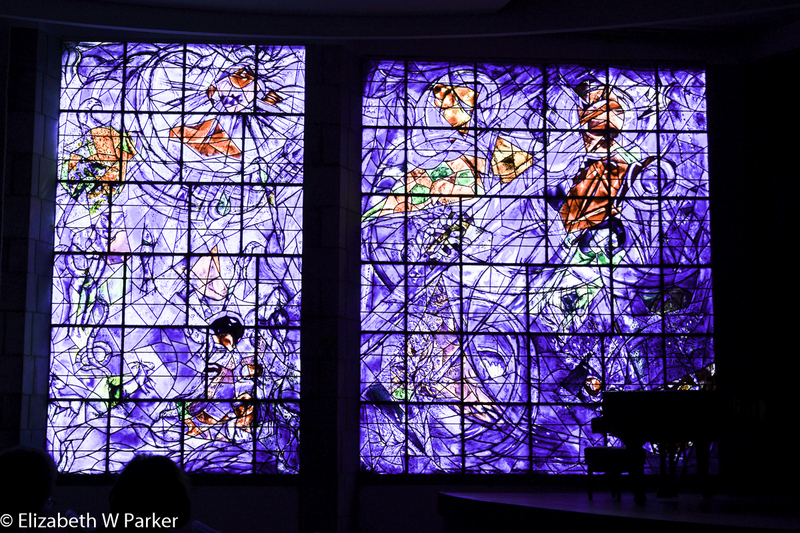 If it seems strange to you that a Belorussian Jew would decorate a Christian chapel in France, be sure to watch the excellent film about Chagall during your visit. The film presents both the man and his work, his successful career as well as the emotional events that shaped his outlook. Much of the beauty of Chagall’s work is in the optimism of his colors. The large canvasses of his Biblical Message are here. (They were never installed in the Chapel.) They are moving as a result of their riotous color but also from the startling use of figurative emotion. This museum was the first public museum in France dedicated to a living artist. We walked again, still downhill, from the Chagall Museum to the Museum of Photography. We had to buy an entrance ticket in one place, then go out and see an exhibit in another and then return to the first place to see the exhibit there. Apparently, we were not the only ones confused by this, as the person who sold us the ticket originally could not understand why we had come back and wanted to sell us another ticket! We finally just asked if we could see the exhibit in the main part of the museum and were conceded the favor. The exhibit in the first gallery was interesting, but a little odd. Most of the photos were not memorable…but some of the techniques were. Though easy to do in a digital darkroom, these had been done in a physical darkroom. The techniques spawned some imaginative thinking about the techniques and their uses. The second exhibit, in the main gallery was very interesting. By an Italian photographer, Franco Fontana, the images were definitely “fine art” – more like paintings than photos. (I hope you can see that from the photograph.) A video about the artist explained his philosophy: To distill what he sees to the exact elements he wants to show the viewer. Again, this is work very worthy of the imagination required to imitate him, on the way to creating a vision of one’s own. The photography museum is right on the Cours Saleya, so we sat in a café, people watched and enjoyed a cold beers and tapas, which included socca, (a typical Niçoise bread made from chickpeas) and tiny olives, which we have been served various times. A walk back to the hotel along the promenade in the late afternoon, returned us to our hotel. We were out again by about 7:30 pm, and reversed our walk along the Promenade back to the Vieille Ville, Thankfully there was no fight tonight to destroy our sense of well-being. We wandered the back streets away from the water and mostly by chance found Comptoir du Marché, where we had a delightful dinner, in what felt to be a little local place. Yes, there were other tourists there, but no one seemed to stick out as such (and I hope we didn’t either). Our waitress was friendly and funny and the evening, as well as the food, quite enjoyable. 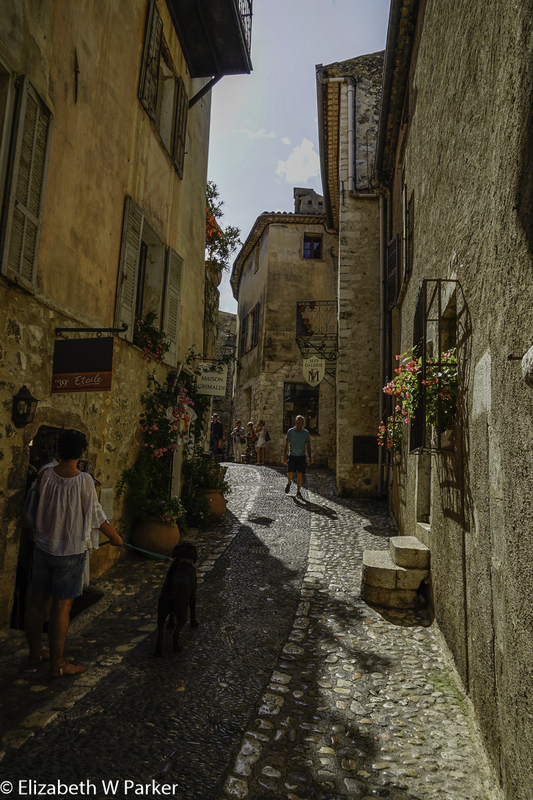 Our plan for the day was to visit Saint Paul de Vence, a recommendation of a dear friend in San Juan. We decided to take the public bus – a 1€50 and 60 minute time investment that would also allow us to see beyond the confines of Nice and the built-up coast. The first bus, the 9:10 passed late and did not stop to pick up any passengers! We waited another 30 minutes and successfully caught the 9:45 bus, also late. The drive was relaxing but hot in the bus, and practically everyone got off at the Saint Paul village stop, so there was really no worry about missing it. 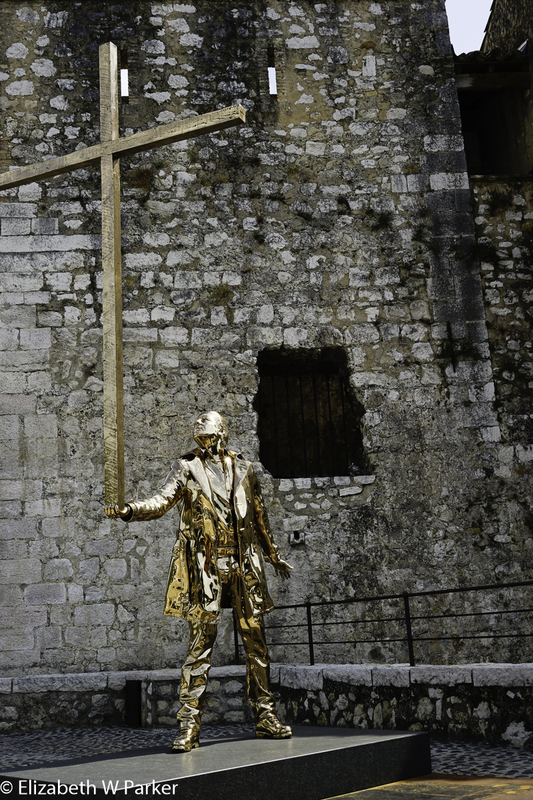 Saint Paul de Vence is a little town, chock full of wonderful art galleries and a great deal of outdoor sculpture, with a medieval village as backdrop. The contrast is enlivening! We enjoyed our walk through the narrow streets, the buildings are well-preserved from their medieval roots, people were friendly and the tourists numerous, but well-behaved. We loved looking in the windows of the galleries and imagining pieces for this or that space, but we actually stopped in a fan shop and met a woman who after a busy career in costume design and production, now lives in her hometown and has taken over her grandmother’s shop, making and selling ladies’ fans. View of Saint Paul de Vence. 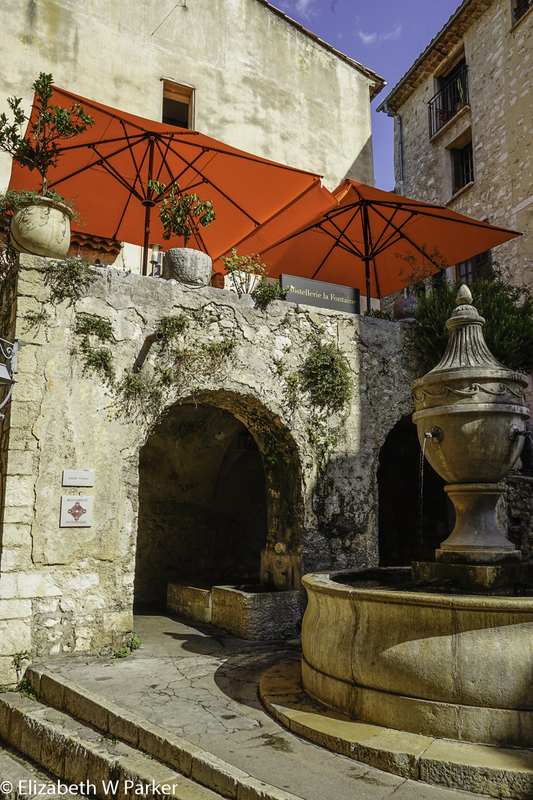 La Fontaine of our restaurant. We had a nice lunch in the Restaurant la Fontaine. A very cold beer to cool us off, and delicious food to refuel, and we were ready to continue our strolling. We took the mid-afternoon bus back to Nice. We sat next to an Argentinian man on the bus who had been traveling alone for 6 weeks. Apparently, Gerry was the first person he had talked to in that entire time, and he made up for all that enforced silence on the hour trip back to Nice. Thundershowers greeted us in Nice. Strangely, you could look out over the water and see blue sky and lovely seas, but looking over the town, dark menacing clouds loomed. Just as we entered our hotel, the clouds burst and down came the rain. The air cooled significantly. Tomorrow we leave Nice, for Ajaccio, Corsica. Keep reading!